Melbourne’s Colonial Tramcar Restaurant combines sightseeing with high-class dining for an unforgettable city experience. This fleet of burgundy vintage trams has been transformed into a luxurious restaurant-on-wheels, serving up gourmet cuisine while cruising around the city’s top neighborhoods. Book a seat on the Colonial Tramcar Restaurant and choose a 4-course lunch, an early 3-course dinner, or a more leisurely 5-course dinner later in the evening. Onboard, meals featuring fresh produce are served alongside fine Australian wines. For an in-depth city experience, combine your meal with a Melbourne city tour to also cruise the Yarra River, visit Brighton Beach, and stroll through the Royal Botanic Gardens. Vegetarian and gluten-free menus are available; contact the restaurant in advance for other dietary needs. All tramcars are air-conditioned and heated as needed. The restaurant dress code is smart-casual. The vintage tramcars are not wheelchair accessible. Wheelchairs can be stored during your visit, and assistance can be arranged with advance notice. The tramcars leave from tram stop 125 in Melbourne’s Southbank neighborhood, close to Crown Casino and the Melbourne Exhibition Centre, and roughly 10 minutes walking distance from downtown Melbourne. The nearest train station is Clarendon Street Junction. 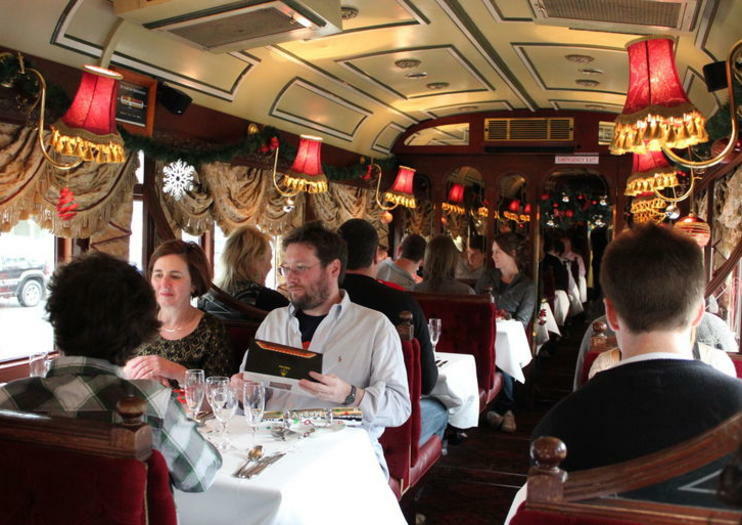 The tramcar dining experience runs year-round. Tickets can sell out during summer, so it’s best to book well in advance during this time. The tramcar restaurant also provides special themed menus for holidays including New Year’s Eve, Mother’s Day, and Christmas. Don’t forget to look out your window as you tuck into the restaurant’s seasonal food—the Colonial Tramcar Restaurant tour follows a scenic route through the city streets and Melbourne suburbs, and the tram’s slow speed allows plenty of time to enjoy the views and take photos. A typical route passes through Albert Park, the beachside neighborhood of St. Kilda, and the markets and galleries of South Melbourne.